A new community-building event for Downtown residents, workers, visitors, and their pets kicks off this Sunday from 4-8pm at Notre Dame Park (intersection of Almaden Boulevard and Carlyle Street). This park exists today thanks to a group of Downtown residents that started a grassroots effort to clean out the unused lot and add some greenery. 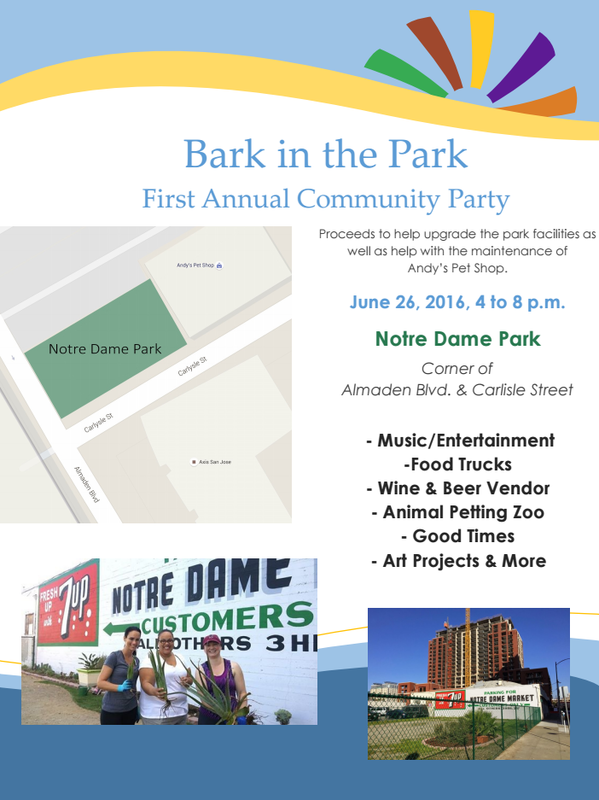 The "Bark in the Park" event will have music, food trucks, wine, beer, an animal petting zoo, and art projects. Proceeds will go towards upgrading the park and helping with the maintenance for Andy's Pet Shop. With so many new residents comings into the Downtown area, we need to encourage more projects like this to improve the quality of the Downtown neighborhoods and create a stronger sense of community in the area!